Censorship on the Internet: how far can Mattel go to protect their interests? A couple of days ago, I saw a post by a fellow doll collector on Facebook : it mentioned that a common friend and popular doll blogger, Ada - better known as Papusile Mele had been blocked on Facebook and could not post anything for the next few days. I soon discovered that she had been blocked by Mattel. 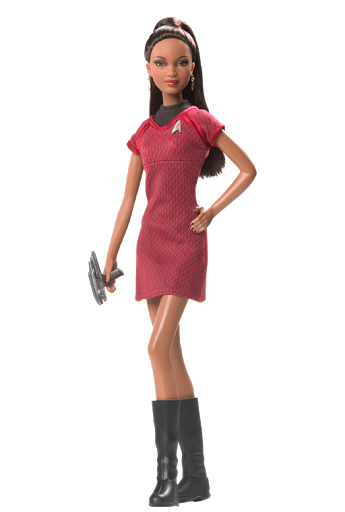 The reason for this was that she had posted on her Facebook page a sneak preview photo of the upcoming Mattel Star Trek dolls. That photo, showing three upcoming dolls from the Star Trek series (Spock, Kirk and Uhura in the likeness of the original actors), had been already posted in many Facebook groups, chat rooms and even some obscure online shops (Ada posted a Linkin to a Greek one! ), so blocking her for posting it was a bit extreme - and without even warning her first or asking her politely to delete it, as would have been the proper way for Mattel to follow. Companies have the right to restrict the use of their photos, especially of they are from unreleased products or have been made known to certain groups of people under condition of confidentiality and guidelines for their publication. That would be the case, for example, with photos of dolls send to W Club members by Integrity Toys or the Barbie Collector club and their sneak pics. From what I know about this particular case, this is not a sneak photo from a club etc., but a picture probably leaked online by someone with access to it. So, however ridicule may sound to you, it is perfectly legitimate for Ada to post it, until Mattel asks her to pull it down. Which never happened. She got blocked for three days instead. Just like that. It sure does not look good for Mattel - it makes them look like a bully scaring people off. Which is exactly the opposite of what a company like it should be doing. Was it that hard to simply ask for the photo to be taken down? And the irony is that Ada is a genuine Barbie fan: her blog and Facebook page is a testament to that and a source of valuable information for Barbie collectors all over the world. It is ridiculous to attack people who support the doll industry like this, especially when they do better PR for their product that the company interested. All photos are courtesy of Mattel, from previous Star Trek releases.